FINE GAEL MIGHT change its party rules to ensure that a special party conference will have to be convened if the party decides to enter into a coalition government with another party or enters into another confidence and supply arrangement. At the party’s Ard Fheis kicking off today, the party will consider a rule change to its constitution to allow an electoral college made up of TDs, senators, MEPs and councillors decide on any future partnership government deal. At present, Fine Gael’s participation in government only has to be ratified by its parliamentary party. The motion, due to be voted on this weekend, will not give every party member a vote. Similar to how the party elects a new leader, the electoral college will be weighted. The parliamentary party will have 50% voting weight. The votes of Constituency electors will comprise 25% of the total poll, while 15% of the total vote will come from local councillors. The votes of the Executive Council will comprise 10% of the total valid poll. The proposed rule states that the special conference will be asked to vote on both coalition and “partnership” governments, which is defined as “an arrangement whereby Fine Gael is enabled to enter into Government supported by a party, grouping, or individual/s from the opposition”. With Brexit chaos taking hold this week, talk of a general election this side of Christmas has dissipated. But all sights are on early next year. Depending on the returning numbers, the party (which is currently topping the popularity polls) could be looking to cobble together a partnership government with parties and groupings such as The Green Party, the Social Democrats, Independent Alliance (again) and independent TDs. The Labour Party (which was in government with Fine Gael prior to 2016) voted on its party conference to establish “red lines” if the party decides to re-enter a coalition arrangement again. Howlin said that in advance of the next general election, his party will publish a list of core red lines and demands. “Labour will not support any Government that does not meet each and every one of our ‘red lines’,” he said. Re-entering government as a junior partner is seen as a massive risk to Labour, which currently only has seven TDs. There’s always the possibility of the “grand coalition” with Fianna Fáil, perhaps. Or Sinn Féin. 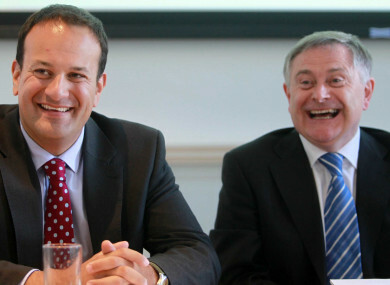 Though Fine Gael has ruled out entering government with the Sinn Féin party, as has Fianna Fáil. Whatever the next government might look like or who makes it up, the message from Fine Gael’s General Secretary Tom Curran is that an election could happen at any time. “As we approach the end of the year, we are preparing for the local and European elections which are scheduled to happen in 2019 – and preparing also for a General Election, which could happen at any time,” he said in the opening note of the party’s Ard Fheis clár. Email “Final say on FG entering coalition government with another party may have to go to a vote”. Feedback on “Final say on FG entering coalition government with another party may have to go to a vote”.